If you are on the lookout for a be-everything do-everything cooler, then you have come to the right place. 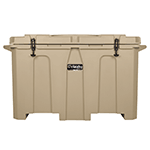 The Grizzly line of coolers can be taken on the go for your next camping trip, hunting adventure or hanging out in the parking lot before the big game. There are many grizzly coolers for sale, but are they right for you? That’s what we’ll unpack in this Grizzly cooler review. Let’s get started. You can get your standard cooler at any big box store. 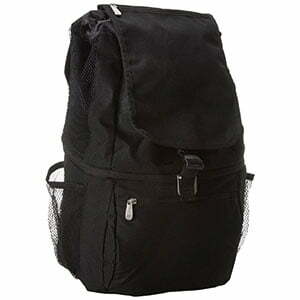 While this will do for a short picnic (as in two hours), what it won’t do well on is your long extended camping trip. This is where the rotationally molded plastic Grizzly ice chest really stands head and shoulders above the rest. Otherwise known as roto-molded coolers, this process creates an even and consistent cut along the entire cooler (watch a video below to learn more). 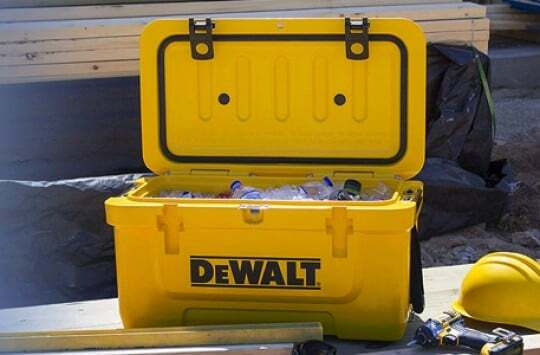 This nearly perfect design means toughness and tremendous ice retention times, not to mention a pretty good looking cooler to boot. When we mentioned earlier that the Grizzly coolers for sale was a be-everything do-everything cooler, we meant it. In fact, if you are looking for something smaller that you can put in the backseat of your car, or larger that can go into your truck bed, then the Grizzly ice chest has got you covered. Here’s a look at their available sizes. 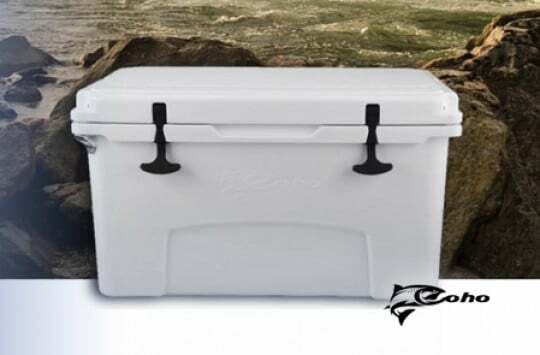 The smallest of the Grizzly coolers holds 5 Pounds of Ice and (15) 12 ounce cans. This cooler also measures in at 18 ¾” x 11 3/8” x 14 3/8”. Next in line in is the G20, which holds 5 Pounds of Ice, and (24) 12 ounce cans. This cooler measures in at 20 ¼” x 14 ½” x 14 ¼”. The next size up has the capability to hold 10 Pounds of Ice and (66) 12 ounce cans. The G40 also measures in at 25 3/8” x 16” x 15 3/8”. 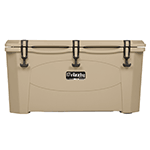 Right in the middle of the Grizzly coolers for sale you’ll find the G60 which will let you hold 20 Pounds of Ice and (72) 12 ounce cans. Measuring in at 30 3/8” x 17 3/8” x 17 ¼” making it a nice mid-sized cooler. Heading up on the larger side is the G75 with an ability to hold 20 Pounds of Ice and (84) 12 ounce cans. This cooler also measures in at 33 1/8” x 17 ¾” x 17 7/8”. Second largest of them all is the G50 with a large capacity of 30 Pounds of Ice and (144) 12 ounce cans. 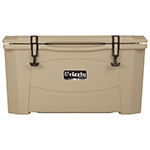 This cooler also comes in at 48 ¼” x 23” x 19 ¾”. Coming at a whopping capacity of 60 Pounds of Ice and (504) 12 ounce cans is the G400. This extremely large cooler comes in at 54 ½” x 31” x 31 7/8”. Read customer reviews on Amazon right here. As you can see, you can host a few friends with the G15 or several hundred friends with the G400. 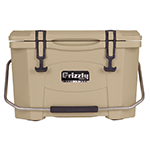 We’re sure you’ll be able to find Grizzly cooler on sale here to suit your needs. This is the one area that many want to see when it comes to coolers – just how well will they perform? According to the Grizzly Site, here are their testing results for each cooler holding cubed ice in a 90-degree environment. Custom coolers such as green, white tan, sandstone, tan with graphics, etc. Another user mentioned that it sat out in the sun for five days straight and still held ice. The user also mentioned that it was better than some of the more expensive and better-known coolers. Yet another user mentioned the great ice retention of about a week on one of the smaller models, leaving it in their truck and keeping drinks and lunch cold continuously. Grizzly Coolers Vs Yeti: Which Is Better? Our readers often ask us which one we would choose. We get this question quite a bit when it comes down to Grizzly coolers for sale and Yeti coolers. We thought we’d share our personal opinion on them, since many of you asked. While ice retention times will vary, they come pretty close when you are looking at these two side by side – The G15 and Yeti Roadie. Where you will find more options however is in color. The Grizzly offers you more in the way of color than the three for the Roadie. Where you will also find a bit of a difference is in the cost. Depending on where you purchase your Grizzly, you can get it at a much cheaper rate than the comparable sized Roadie. While you could make arguments for both sides, when it comes down to it we would most likely opt for the Grizzly lineup. We’d choose Grizzly coolers for pure value for your money. The choice is still up to you, but we thought we’d answer the question since we get it quite often. Either way, you should check the latest Grizzly coolers prices here, on Amazon. 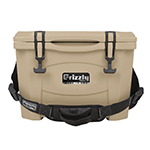 Where To Buy Grizzly Coolers on Sale? There are many places that you can actually purchase the Grizzly cooler. One of these places is on the manufacturers website, but the one we recommend primarily is Amazon. 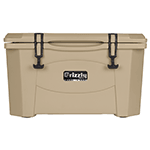 For your convenience, here’s a link to the Grizzly coolers Amazon page. Amazon can offer you much more when it comes to picking up your Grizzly Cooler. Not only can you potentially get it at a better price, BUT you’ll be able to see what other actual users have experienced with the cooler you are looking at. Free shipping is also an important argument. As we mentioned earlier in this review, if you have been on the lookout for a be-everything do-everything cooler, then you really can’t go wrong with the Grizzly lineup. 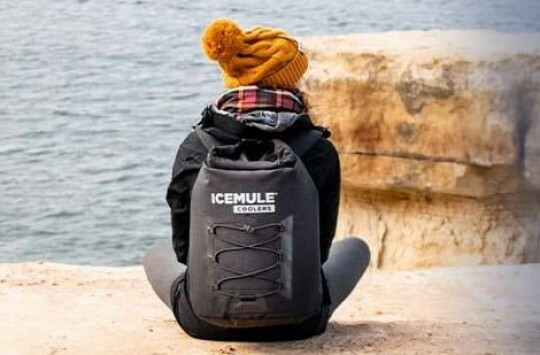 Not only will you be able to find one to suit all of your needs (several people to several hundred people), you’ll also receive superior ice retention times, a great price and a large amount of colors to choose from, to name just a few features. 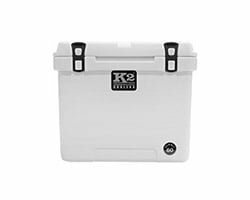 Throw in the fact that these coolers come with a lifetime warranty and are certified bear resistant, and Grizzly Coolers for sale just got that much more appealing. 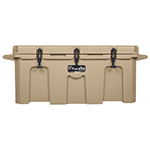 If you are looking for a cooler that can last through any physical environment you will be subjecting it to, then you need to check out a Grizzly ice chest. 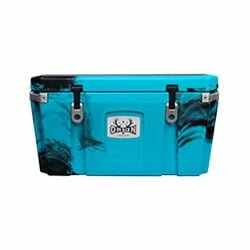 If you are also in need of a cooler that won’t put a large dent in yout pocketbook, then you definitely need to check this one out. ps. If you’ve ever wondered how the rotomolding process looks like, watch this video that gives a look into it. That’s how Grizzly makes their tough coolers.